While I’m not originally from this area, Venango County has become my home and I feel fortunate to have started my business here about 40 years ago. While growing up in Pittsburgh, I always wanted to be a farmer, as I was constantly playing with toy animals and tractors. After graduating from Delaware Valley University in 1972, I worked on a dairy farm in Evans City, but knew I eventually wanted to start my own business as a farmer. There were not many farms available in the Pittsburgh area, so we continued to look throughout the state and ended up finding the perfect fit in Emlenton. Not only is our land spacious and beautiful, but it’s less than 10 minutes from Interstate 80, allowing us to travel easily and even commute to work, which my wife Liz did for awhile after we relocated. 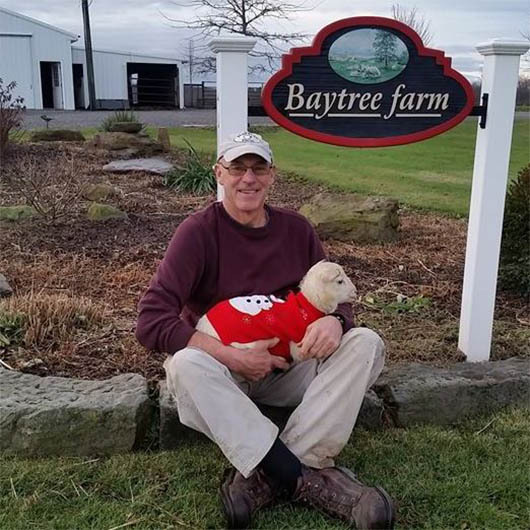 For the first 20 years, we had a dairy farm, but decided in 1999 that we wanted to go a different direction with less intense work, so we moved to sheep farming instead. There are only a few people making a living off of sheep farming in this area, and I’m proud to be one of them. Besides our 350 sheep, we grow and sell fall produce each year, including pumpkins and gourds, and we host a variety of events, including an annual Fall Festival, “Lamboree,” and Agriculture Awareness Day, hosted with the Venango Conservation District. As a first generation farmer, I learned the ins and outs of what it takes to start a business from scratch. Running a business is a sacrifice, but you get to enjoy the fruits (or meat and vegetables) of your labor. Although we work hard, our time in Venango County has not been all farming; we also enjoy the many ways to play in this area. We participate in outdoor activities, attend shows at the Barrow-Civic Theatre, dine at local restaurants, drive around to view the beautiful Victorian homes, and just enjoy the natural beauty this area is fortunate to have. We always have something to do! Out of all the reasons we love it here, the community is what we appreciate the most. We’ve met many lifelong friends whom we enjoy the local amenities with and acquaintances whom we work together with to make change. I have had the opportunity to serve with organizations such as the Venango County Planning Commission, AC Valley School District, Venango Conservation District, Oil Region Alliance, Venango County Land Bank, and, most recently, Bridge Builders Community Foundations. I have also helped to start the Venango Area Community Gardens initiative, as well as a local meat pick-up in Oil City with Gruber’s Farms. We would not be as successful and happy as we are today if we didn’t get involved throughout the community as much as we have. Venango County has become our home and we have made a decent living here, and I believe we need to help others do the same. In my opinion, this is a wonderful place to be, and I aim to contribute to the community and encourage others to do the same, to help shepherd the future in a positive direction for years to come.